Born in 1939 in Pontchartrain, in the Yvelines. Lives and works in Paris and Siena. Between 1957 and 1963, Fromanger studied at the Académie de la Grande Chaumière and in night classes given by the City of Paris in Robert Lesbounit’s studio. He entered the Ecole nationale supérieure des Beaux-Arts, which he quickly left in order to work for two years in the studio of César. He met and became friends with Merri Jolivet, Gilles Aillaud, Eduardo Arroyo and Antonio Recalcati. In 1964, Alberto Giacometti and Jacques Prévert introduced him to Aimé Maeght who asked him to join the gallery. In 1965, Jacques Prévert wrote a preface to his work for the first time for an exhibition at the Galerie Maeght. Fromanger exhibited at the Salon de la Jeune Peinture a quintuple portrait of Gérard Philippe, Le Prince de Hombourg, an emblematic work in the transition from grey to color, marking the entrance of the artist into the New Figuration and Narrative Figuration movements. In 1967, Fromanger left the Maeght Gallery and exhibited his Paysages découpés (Cut-up Landscapes) at Jean Taffany; in 1968, he exhibited at the Salon de mai the first of his Souffle (Breath) sculptures and participated, in May and June, in the Atelier populaire de l’Ecole des Beaux-Arts, with the collaboration of the artists Aillaud, Arroyo, Buraglio, Jolivet, Le Parc etc. They would close it with the last poster, after the evacuation of the Beaux-Arts by the police at the end of the month of May: “La Police s’affiche aux Beaux-Arts, les Beaux-Arts affichent dans la rue” (“The Police Show Up at the Beaux-Arts, the Beaux-Arts Shows Up in the Streets”). Among the propositions by Gérard Fromanger that were rejected, that of using the tricolor flag, to make the red stain into the white and the blue; the poster would become a film with Jean-Luc Godard, then nine monumental spherical sculptures in Plexiglas, Les Souffles (The Breaths). 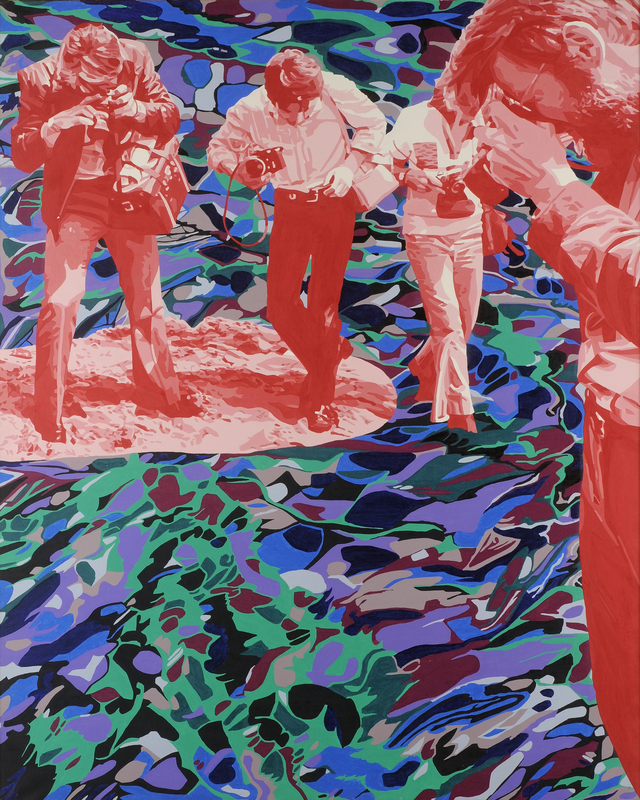 In 1970, Fromanger won the first prize of the Printmaking Biennial in Tokyo with the album Le Rouge. In 1971, the Musée d’Art moderne de la ville de Paris dedicated a solo exhibition to his work around the series Boulevard des Italiens (with a preface to the exhibition catalog written by Jacques Prévert and Alain Jouffroy). In 1973, Fromanger joined the Jeanne Bucher Gallery and presented the series Annoncez la couleur. In 1974, he participated in the 2nd trip undertaken by French intellectuals and artists to China and used it as an inspiration to create the series Le désir est partout (Desire is Everywhere), exhibited at the Jeanne Bucher Gallery in 1975. The preface to the exhibition catalog was penned by Michel Foucault. That same year, the Museum of Modern Art of ‘s-Hertogenbosch dedicated a retrospective to the artist. In 1977, Fromanger participated in the exhibition Mythologies quotidiennes (Daily Mythologies) at the Musée d’art moderne de la ville de Paris, an exhibition-manifesto of Narrative Figuration. In 1979, Fromanger executed the series Tout est allumé that the Jeanne Bucher Gallery refused to exhibit in 1980. That marked the ending of the collaboration between the artist and the gallery. Several months later, the series was presented at the Centre Pompidou by Pontus Hulten. It was the first solo exhibition of the artist at MNAM. In 1980, Gérard Fromanger moved to Siena where he has lived and worked regularly since. Between 1983 and 1985, four retrospectives were dedicated to his work: at the Palazzo Pubblico / Magazini del Sale in Siena, at the Musée des Beaux-Arts of Caen, at the Kunsthalle of Lund and at the Fuji Television Gallery of Tokyo. Thereafter retrospectives would be given in West Africa, Bamako, Dakar, and Abidjan during the years 1984-88. In 1992 the exhibition Gérard Fromanger 1962-1992 took place at the French Pavillion of the Universal Exhibition of Seville; at the 1993 FIAC in Paris, the artist exhibited the first Quadrichromies, which went on to be exhibited in 1995 at the Hayakawa Gallery in Osaka, at the Santa Maria della Scala Museum in Siena and at the Xippas Gallery in Paris. In 1996, Fromanger participated in the exhibitions “Face à l’histoire, 1963-1996” at the Centre Pompidou, and “Les Sixties, années utopies : France, Grande-Bretagne, 1962-1973” at the Museum of Contemporary History in Paris and then at the Brighton Museum. In 1998 the works of the artist were presented in the exhibition Figuration narrative (Narrative Figuration) in Hong Kong and Macao. That same year he presented his series La Vie quotidienne (Daily Life) at the Quartz in Brest. On the occasion of the publication of Photogenic Painting by Sarah Wilson and the Courtauld Institute of Art, with texts by Gilles Deleuze and Michel Foucault, a retrospective was dedicated to his work at the Gimpel Fils Gallery in London. In 2000, the series Rhizomes, pastels-café, then Rhizomes, paintings-café, with a preface by Stéphanie Moisdon, were exhibited at the Claude Samuel gallery in Paris and the musée Santa Maria della Scala in Siena. On the occasion of For Ever Godard, Godard’s and Fromanger’s 1968 film-tract Rouge was presented at the Tate Modern. In 2002, the Royal Academy of Arts, then the Guggenheim Bilbao exhibited Souffles de mai 68 in the exhibition Paris, Capital of the Arts, 1900-1968. In 2003, MAMCO in Geneva dedicated the exhibition La guerre n’est jamais froide (War is Never Cold) to the artist. The Montreal Museum of Fine Arts presented a selection of his works in the exhibition Village Global, les années 60. Fromanger participated in the exhibition Moi, autoportrait du XXème siècle (I, self-portrait of the 20th Century) at the Musée du Luxembourg, Paris and the Uffizi Galleries in Florence. In 2005-2007, again many retrospectives: at the National Museum of Contemporary Art in Korea, at the Musée d’Histoire et d’Art du Grand Duché in Luxembourg, and at the National Museum of Fine Arts of Havana (exhibition catalog prefaced by Bernard Ceysson). Group exhibitions also took place at the Museum of Fine Arts of Shanghai and Canton and at the Millennium in Beijing under the auspices of the French Year in China, which offered a point of view on French Contemporary Art taken from the collections of the Centre Pompidou. In 2007, the artist created the sets, for the 2nd time, for the ballet Hymnen, with music by Stockhausen, choreographed by Lia Rodrigues and Didier Deschamps, which premiered at the Opéra de Lorraine and then toured internationally. In 2009, in the context of the French Year in Brazil, an important retrospective, Gérard Fromanger: L’imagination au pouvoir (imagination in power), 1962-2009, was organized at the Centro Cultural Banco do Brasil in Brasilia, then at the Museu de Arte Moderna in Rio de Janeiro. In 2012, Fromanger was invited to inaugurate the Capucins de Landerneau with the exhibition Périodisation, 1962-2012, presented by Hans Ulrich Obrist. In 2014 the exhibition Annoncez la couleur was presented “at 100 meters from the center of the world,” in Perpignan. In 2016, the Centre Georges Pompidou, Paris, dedicated the exhibition Gérard Fromanger to his work, curated by Michel Gauthier. That same year, the exhibition Annoncez la couleur was presented at the Musée des Beaux-Arts d’Agen, in 2017 at the Château de Vascoeil, and in 2018 at the Abbaye Saint-Jacques-des-Vignes in Soissons. On the occasion of the publication of the book Fromanger – De toutes les couleurs, Entretiens, by Laurent Greilsamer in May 2018, the Jeanne Bucher Jaeger Gallery organized a new exhibition dedicated to the artist, from May 31 to July 21 2018, presenting works from 1962 to 2017. This exhibition takes place more than forty years after Fromanger’s last solo exhibition at the Gallery, in 1977, around the series Questions. On June 9, 2018 the artist inaugurated the cycle “Un jour, une oeuvre” at the Centre Pompidou with the presentation of his work In China, at Hu-Xian at Villeneuve la Garenne.